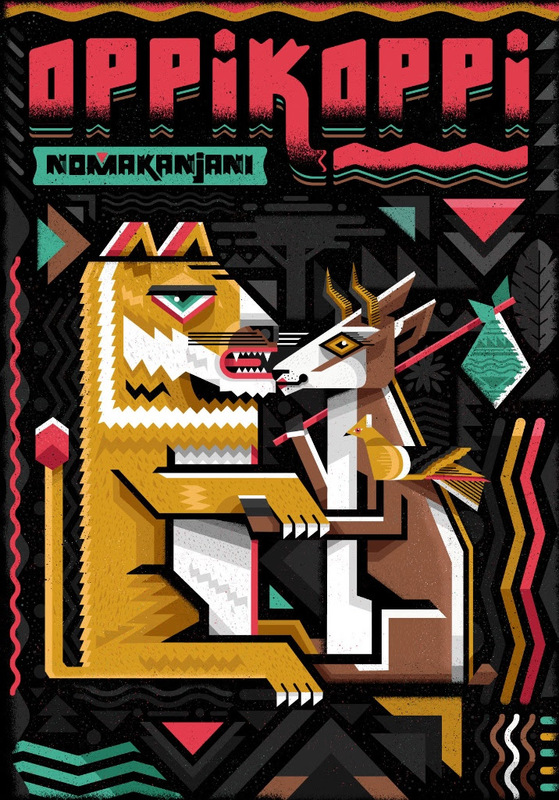 What did you draw inspiration from for the Nomakanjani design? For the last couple years I have been inspired by bold and stylised retro illustrations. African aesthetics, local animals, nature and African patterns are all narratives that inspire my work. Of course the focus of inspiration for the poster was the song 'Nomakanjani' by Brenda Fassie. I read the lyrics and listened to the song and was inspired by the words. I had the idea of drawing two different animals that are in love but, perhaps, their tribes are not happy about the relationship! So in a way, they set off on an adventure, leaving outdated traditions and conservative values behind. So as a whole the artwork is representative of an acceptance and unification of different cultures. In way the OppiKoppi Festival does this with a range of different musicians that perform at the festival. Did previous OppiKoppi experiences of your own play a part in you envisaging the artwork? Some standout experiences? I haven’t had the opportunity to attend the festival, but having played in a band many years ago, which toured South Africa and played a few festivals, I have a good feeling of what the festival must be like. It is a legendary festival and I have always been a fan of the previous OppiKoppi posters. I am very proud to have done something for this year's one especially as it is rooted in the history of South African music. I cannot wait to do a mural at OppiKoppi and to finally experience it! The poster speaks to a star-crossed bushveld fairytale – do you connect the visual theme to some deeper significance of your own or of the festival? Yeah a lot of my work has some social/political themes running through it but only in a very subtle way. I think OppiKoppi is a great festival that brings different people together in one place – in the bush of all places! Essentially that is what the artwork speaks about. I have always felt that besides the music and the bands, it's about the fun times you have when meeting different people and hanging out. What's currently happening in your life and studio as an artist? I am currently getting ready to paint a mural in Virginia (USA) and then some more murals when I get back to South Africa. I have a couple secret projects for clients that I can’t mention but some of them are illustration projects. I am also building up more art prints which can be bought online and more will be added soon. A lot of these prints are from previous exhibitions or personal projects that I have been exploring lately. One of my favorite projects from 2017 was the 44m long mural for the Cartwright Taxi Rank in Durban, inspired by Boy$nBucks and the taxi driver dance. The artwork portrays various locals doing the taxi dance! Get the OppiKoppi line-up and tickets here. In exchange for a poem or illustration.